Thirty-three feet high, arms relaxed along his body, the man is built with highly flammable wood and lit up at nights from head to toe by green neon lamps. The man watches all of us from a pile of wooden sticks that are forty-five feet tall, and covered by a grayish looking simple structured tent – underneath it we can find the political related art representations developed by the festival’s organizers. 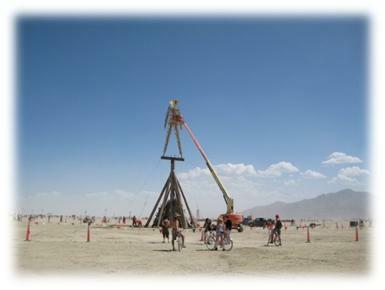 Taller than all other constructions in BM, he also functions as a guide for those who walk or drive around BRC, he’s the center of everything. Everything changes on Friday, when the man burns after a couple hours of some pretty confusing but startling festivities. On the picture above the whole construction is being prepared to turn into a big fire, all it’s surrounding art projects have already been removed. It all starts with some curious so-called world folklore presentations, followed by several minutes of drum beats, all kinds of fire related performance arts and a few synchronized dancing groups representing nature’s essential elements: fire, water, earth and air. Just as the security volunteers finally block the perimeter around the fire, another unexpected mushroom-shaped gas explosion absolutely stuns everyone watching the man burn. Burning him is certainly the biggest party in BM. He represents all burners, and at the same time none of them. To burn him is not only a metaphor to disconnecting from material belongings, but also to emotional selfishness. Although why set such an robust structure on fire? “Because nothing, not even life, lasts forever, and everything that the human hand constructed can be rebuilt.” G.S., England, 37 years old. This central pavilion was surrounded by 15 exceptional art projects: Trees made of junk and recycled materials, questioning the consequences of deforestation all over the world. 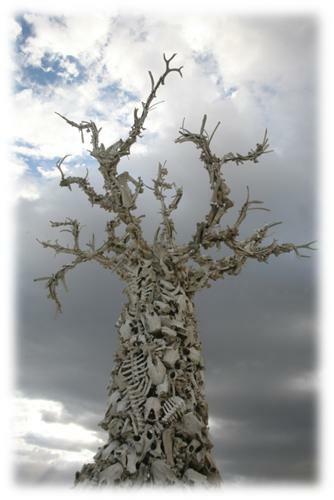 Developed by an animal protection organization , the most intriguing of all is surely a mobile structure build from hundreds of animal’s bones (originally created for the 1999 BM edition).